The Nykaa Luxe Store at The Chanakya is a great place to pick up a mix of luxury and high-street beauty brands, including Nykaa's house beauty products. Luxury beauty products, skincare, perfume, make-up. 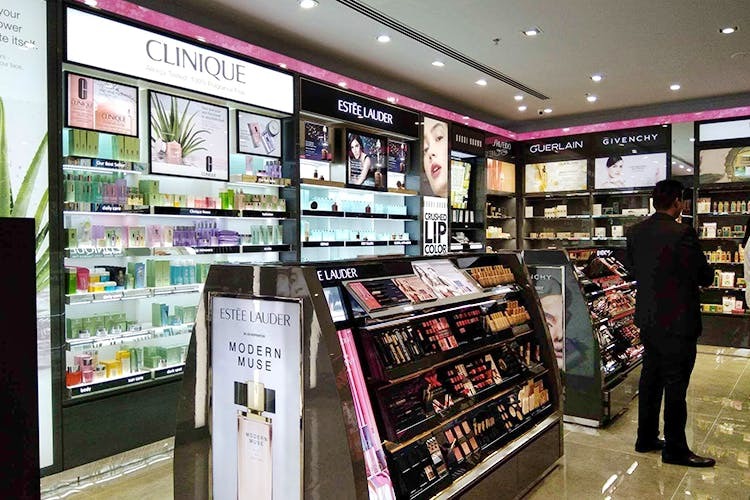 Nykaa Luxe, located on the second floor of The Chanakya, is a large, well laid-out store that is fully stocked with a range of beauty brands. With an extensive perfume section that has everything from Guerlain to Tom Ford and Jo Malone and skincare counters from Clinique, Shiseido & Kama Ayurveda, the store has a lot more than just make-up. What makes it brilliant, though, is all that make-up though! Bobbi Brown, Dior, M·A·C, HUDA Beauty, Givenchy, Estée Lauder, Nykaa... the brands just go on and on. If you're not in the market for super-luxe merch, you'll also find a veritable amount of Nykaa's house brand stuff—particularly their latest and also their most classic launches. For the high-street shopper, there are not enough options, but then again, the 'luxe' addendum acts a disclaimer for that.